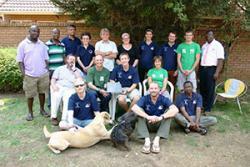 The “Catching the Light” team along with the president of the charity SOS Africa, Henry Matthews. During September a team of scientists from Bangor and Swansea Universities and the University of KwaZulu-Natal (UKZN) ran scientific outreach workshops, for children of all ages, in Durban and Mafikeng, South Africa. The event, Catching the Light with the Rainbow Nation, was an extremely ambitious project with the aim of increasing the popularity and understanding of chemistry in South Africa. Over a two-week period, more than 1300 children took part in workshops centred on chemistry and light. Additionally, the team ran public lectures, school discussion groups and had an afternoon of teaching chemistry and light to children who are helped through their education by the charity SOS Africa. 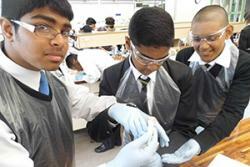 This outreach event was hosted at the School of Chemistry and Physics (UKZN University) laboratories, where local high school pupils undertook workshops on making dye-sensitised solar cells from fruit and everyday materials. Not only did this teach the children how to make and test a photovoltaic device but also emphasised the importance of renewable energy and in particular the pivotal importance of utilising solar energy. Students of Golfview High School, Mafikeng, learn all about light and colour at the workshops.The team also travelled through the Drakensberg Mountains to Mafikeng where they ran workshops for around 1000 children across two different high schools in the area, Golfview High School and Mafikeng High School, as well as the Early Learning Centre (ELC) for children aged 1-6 years. Dr Matthew Davies, project leader, said: “This was a very large scale outreach event; it required lots of planning and hard-work from all of the team members involved. It was a wonderful experience; all the children that attended workshops were very attentive, enthusiastic and appreciative of what we were doing. The primary aim was to inspire the children to take a greater interest in science and feedback suggests that this was achieved. “As a team we hope that some of these children will further discover the wonderful and exciting world of chemistry and science and go on to have successful, happy lives and careers. It was an absolute pleasure to spend so much time with a wonderful team of scientists, teaching and interacting with wonderful and inspiring children. I hope this is the first of many such outreach events”. Tonderai Mombeshora, UKZN, said: “We had come to teach the children about catching the light, but what we caught was the smiles and hearts of hundreds of children”. 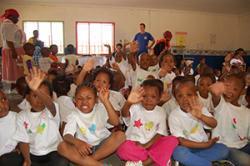 Young children at the Early Learning Centre, Mafikeng make, and show-off, new t-shirts, the t-shirts will now be the school uniform every Wednesday.The outreach event was mainly funded by the SPECIFIC Innovation and Knowledge Centre, Swansea University and was supported by Bangor University, Swansea University, The University of KwaZulu-Natal, STRIP and the Royal Society of Chemistry South Wales West local section. Albert Landman, Headteacher of Mafikeng High School, said: “It it was a good experience, especially in the time where marks have become the beginning and the end and the pleasure of education has been taken away because of the pressure of a better pass rate, which is very short sighted and will not improve education in SA in the long run. The programme can, maybe, just be the spark for a few outstanding scientists! A video about the trip can be viewed here.